Dragon-warrior Venom is alone in the midst of all his coupled-up brothers. His loneliness is exacerbated by the fact that his longing for a mate of his own cannot be fulfilled because, due to his genetic makeup he is toxic (literally) and cannot spend a lot of time with a female without making her sick or even causing her death. He is reduced to short-term interludes that only intensify his longing for a mate. Until he encounters Evelyn Foxe. Evelyn is the perfect fit for Venom but she is weighed down by her current circumstances -out of a job and unable to get another; she’s on the hook with the Russian mob, forced to assume her late mother’s gambling debts and at her wits end, until Venom offers her a lifeline. 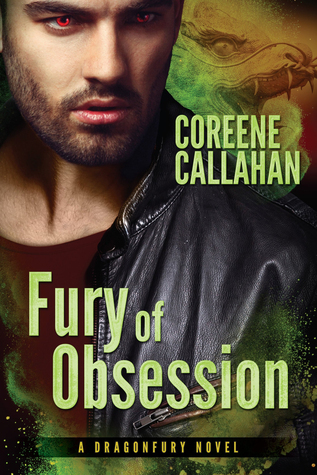 Fury of Obsession is my introduction to the Dragonfury series and to Coreene Callahan’s work, but I am completely blown away by her writing. The story is so much more than what the blurb indicates. The title is apt because the story does not just revolve around Venom’s obsession with finding his mate, but also the obsession shared by Ivar ( and the Razorbacks) and Rodine in destroying the Nightfuries. I love this story because I was completely drawn into the world Ms. Callahan has created and even though I started at the end, there was enough of a back-story to fill in the blanks. The writing is top-notch and engaging, the plot is multi-layered and the characters are well-developed. Fury of Obsession is a top pick for me because Ms. Callahan has skillfully woven a tale that satisfies even as it heightens anticipation for the next in the series. It is the perfect blend of romance, action and suspense. After graduating with honors in psychology and working as an interior designer, she finally succumbed to her overactive imagination and returned to her first love: writing. And when she's not writing, she's dreaming of magical worlds full of dragon-shifters, elite assassins, and romance that's too hot to handle. Callahan currently lives in Canada with her family and writing buddy, a fun-loving golden retriever.